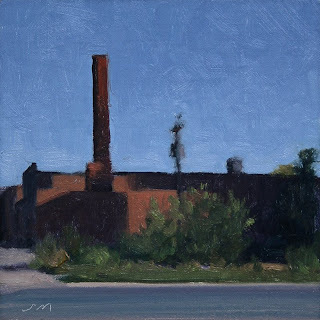 Today's painting is a low building and chimney with late evening shadows. 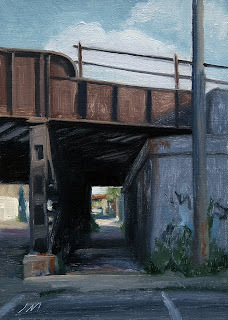 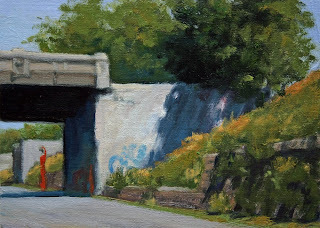 Today's painting is of a RR bridge in shadow. 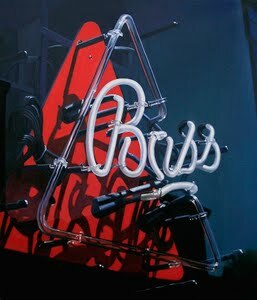 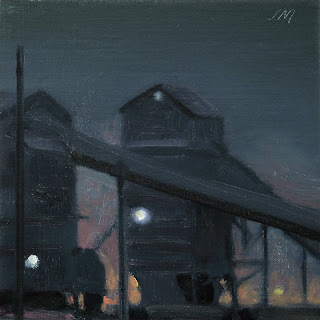 I was drawn to the sharp contrast of light coming through the darkness on this one. 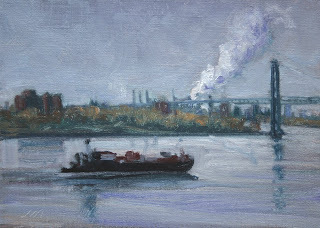 Today's painting is an industrial landscape of the River Rouge. 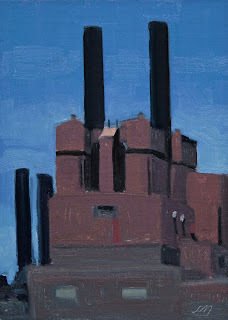 Today's painting is a detail of an Edison Powerplant along the Detroit River. 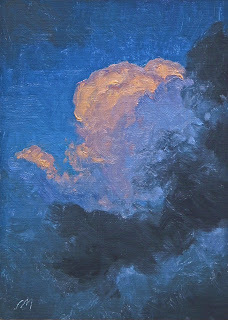 Today's painting is of the evening clouds outside the studio yesterday. 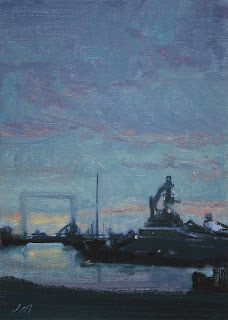 What a beautiful evening sky, I decided to share it with you. 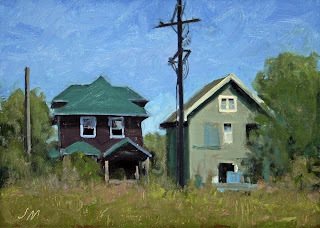 Today's daily painting is two houses as seen from behind, they look like they could use a little loving care. 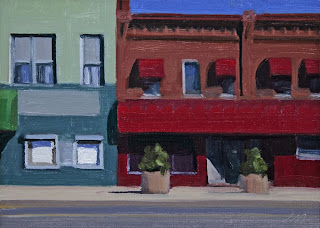 Today's daily painting is a corner storefront on Van Dyke Road. 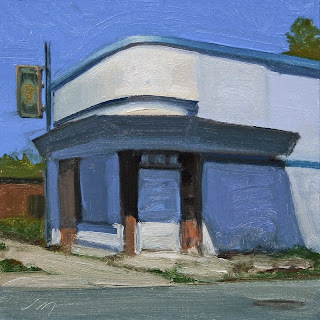 It is vacant now but looking at the signage on the building it was recently a lounge, collision shop and a Ministry. 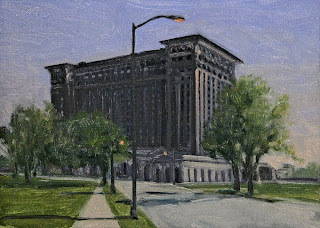 It is interesting how quickly things change in Detroit. 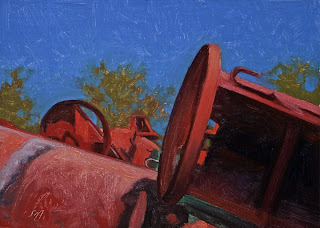 I hope someone can find a new use for it. 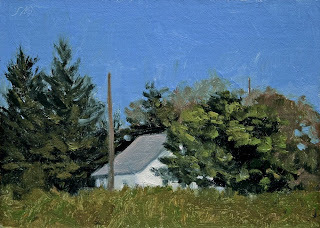 Today's daily painting is a white house along the freeway seen from below. 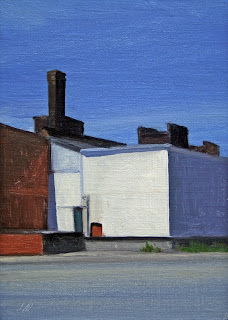 These houses remind me of the rural house Edward Hopper painted in Maine. 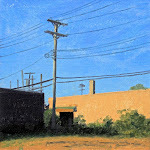 A little vignette of Detroit. 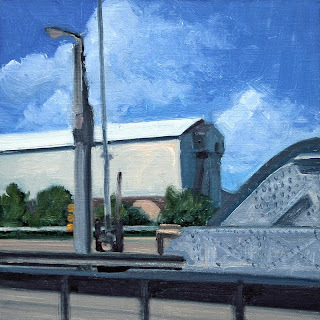 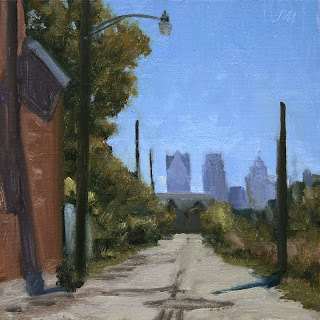 Today's daily painting is is a view of Gratiot Ave near Eastern Market and entrance to the Dequindre Cut greenway. 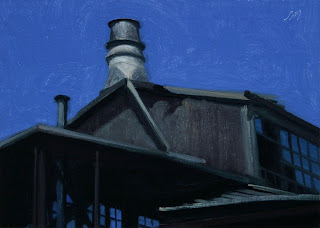 I really liked the simplicity of the shapes in this building. 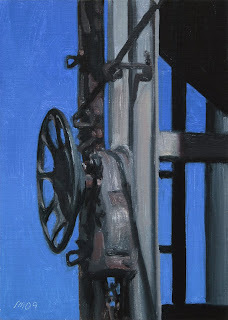 Today's daily painting is an industrial landscape of a downriver steel foundry near the Detroit River. 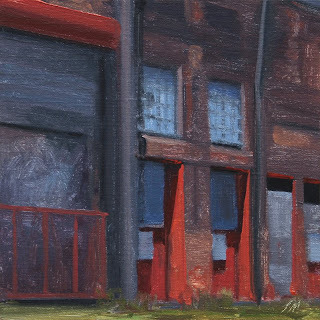 Today's daily painting is a detail view of a building in the old warehouse district near the Detroit River. 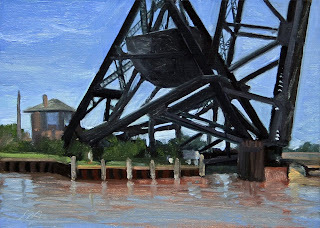 Today's daily painting is a view of channel markers landlocked behind the Coast Guard Station on the Detroit River, looking like giant toy tops. 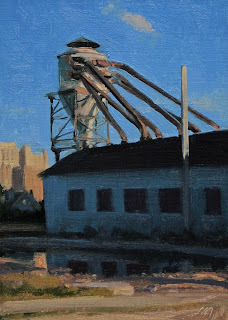 Today's daily painting is of an industrial building in the old warehouse district along the Detroit River. 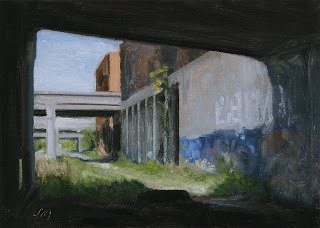 This daily painting is the third in the series of Dequindre Cut paintings, this one is the view looking South from the same location as yesterdays painting. 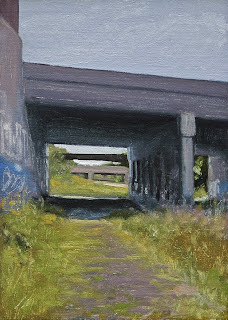 This daily painting is the third in the series of Dequindre Cut paintings, this one is the view looking North at the unfinished section. 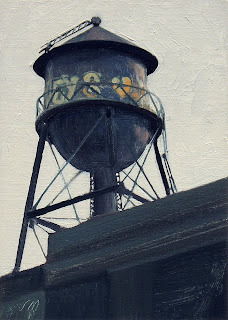 This daily painting is a study in grey of a Midtown water-tank with graffiti tags. 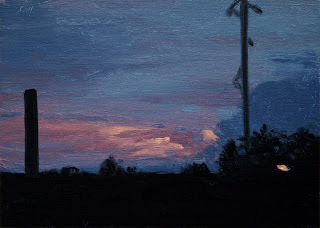 This daily painting is an evening view of some delightful clouds dancing with the last rays of the sun giving them a nice warm glow. 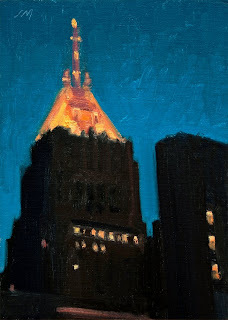 This daily painting is a nocturne of the beautiful 1920's era Fisher Building. 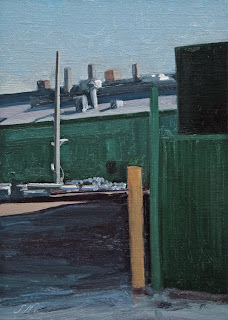 I used to work in a studio across the street from it in the late 1970's. 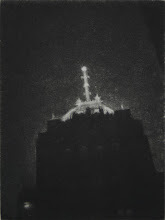 Always a beautiful view, I had a window that looked out on it. 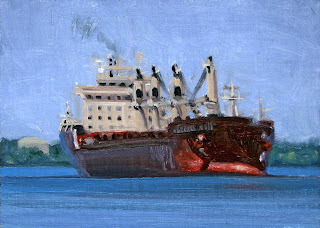 This daily painting is an industrial nocturne on Zug Island and the Detroit River. 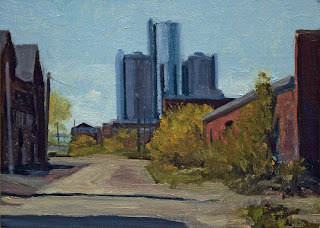 This daily painting is a view of the General Motors Building in downtown Detroit.